I learned yesterday that my dear friend Dr. Howard O. Jones passed away on Sunday at age 89. Dr. Jones was the first African American evangelist to join Billy Graham’s ministry team back in the 1950s. In my book, Reconciliation Blues, I talk about some of the hostility and discrimination that he encountered from other Christians because of his race. I helped him write his autobiography, which was published by Moody in 2003. As I worked with Dr. Jones, I was struck primarily by his passion for God and for preaching the Good News. The gospel seemed to naturally exude from him, no matter what he was doing or discussing. He was a preacher to the core, and he sincerely believed that a relationship with Christ would provide the answer to any problem or trial that we face in this life. I also was struck by Dr. Jones’ devotion to his beloved wife, Wanda, who had been his partner in ministry for more than 50 years. Together they raised five kids and traveled the world to preach the Word of God. When I first met Dr. Jones back in 1997, Wanda had been battling the effects of Alzheimer’s disease for a few years. I recall accompanying Dr. Jones to the Oberlin, Ohio, nursing home where Wanda was a resident for the last few years of her life. I remember the tender way that he fed her and read to her from his Bible. Though she could no longer speak, her eyes seemed to light up as he spoke to her. When Wanda died in 2001, Dr. Jones was devastated. But he held on to his faith in God, and he would tell Wanda’s story (and pass out copies of her book) wherever he went. Dr. Jones was a great man of God who loved Christ with all is heart. I’m grateful that I had the chance to know him personally and to help him record his story for posterity. He leaves behind a legacy of faith, courage, and reconciliation that should inspire the church for generations to come. If you’re interested, you can read my 1998 Christianity Today profile of Dr. Jones. I interviewed him for Decision magazine back in 2002. 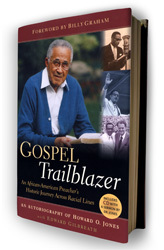 Also, his autobiography, Gospel Trailblazer, is available through Amazon. On Wednesday afternoon, Nov. 4th, several folks gathered on a phone call to talk about the various postings related to the Deadly Viper’s book. The people in the conversation were Mike Foster and Jud Wilhite (Authors), Chris Heurtz (Director, Word Made Flesh), Soong-Chan Rah (Prof., North Park), Kathy Khang (InterVarsity Multi-Ethnic Ministries Director), and Eugene Cho (Pastor, Quest Church). The conversation was facilitated by Nikki Toyama-Szeto (Urbana 09 Program Director). One of the toughest parts of being the author of a book about racial reconciliation is that when the latest racial incident flares up, everyone expects you to chime in with your two cents. I’m feeling a bit penniless on this current one, but here goes anyway. The “current one” I’m talking about is the controversy surrounding a new book from Zondervan called Deadly Viper Character Assassins: A Kung Fu Survival Guide for Life & Leadership. The book, which was coauthored by Mike Foster and Jud Wilhite, uses images, symbols, and caricatures of Asian culture as a light-hearted vehicle for getting at the heavy issues of Christian integrity and character. Not surprisingly, the book has upset a fair number of Asian American Christians, as well as many of us who are not Asian but who identify with the pain felt by our brothers and sisters who are offended by the book’s use of stereotypical imagery and caricatures. The book is clearly meant to be a fun exploration of character and leadership, and it has been praised by many for its fresh insights and clever presentation. But it appears the authors have inadvertently stumbled into thorny and treacherous territory that they did not know existed; they were simply trying to dispense timeless wisdom in a timely and accessible way. Well, now they know. Ironically, one would think the book’s publisher, Zondervan, would’ve better anticipated the Asian community’s reaction to the book, given an earlier controversy that followed the publication of a book from its Youth Specialties branch. In that episode, Zondervan and Youth Specialities took heroic measures to publicly apologize and correct the offense at a considerable financial cost. Hopefully, this latest episode will have a similarly redemptive conclusion. Yet, I wonder if things could’ve been handled differently earlier on. My friend Soong-Chan Rah, who has become one of the evangelical church’s most vocal (and effective) activists on these types of issues, inspired this latest movement with his initial blog posts about the Deadly Viper book and a promotional video on Facebook. Soong-Chan’s open letter to the authors and Zondervan is quite provocative. But what’s most fascinating, and perhaps even instructive, is the slew of comments related to Soong-Chan’s posts, as well as an evolving thread over at the Deadly Viper blog. I must confess that I’m not totally comfortable with the way the protest has played out so far. It’s not that I disagree with the gist of it. I think it’s important to call attention to these types of things, especially when they’re happening within the Christian community. However, my initial impression is that the high level of “shock and awe” that Soong-Chan and others have brought to this issue probably has been a bit overwhelming and confusing for Foster and Wilhite (though I think Zondervan should’ve seen it coming). Maybe I’m just feeling a little squeamish about this necessary phase of protest. I know that hard and unpleasant honesty must often precede genuine dialogue, repentance, and reconciliation. Still, I get the sense that Foster and Wilhite had no clue that their earnest effort to create something entertaining and edifying would be perceived as being wrongheaded and insensitive by so many. I’m sure it wasn’t even on their radar that appropriating Asian culture carried with it an obligation to “take it seriously.” They were simply parroting the stereotypes and jokes that are now so common in American pop culture. Parodying Asian culture has become so commonplace in America that many of us naturally assume that the Asian community is in on the joke. When I was a child, I would watch Hong Kong Phooey every Saturday morning. Every kid on the playground wanted to be Bruce Lee. The Karate Kid movies ruled in the ’80s. Last year Kung Fu Panda made hundreds of millions at the box office. And fried rice, egg rolls, and sushi are just as “American” as French fries, pizza, and tacos. We take it all for granted, and I would surmise that many white Americans believe that Asians are now so assimilated into American life that they have no problem with the tongue-in-cheek references to their various cultural heritages. Asians, after all, are a peaceful people. They’re certainly not as hyper-sensitive about race as (for instance) African Americans are. There are no Asian American Jesse Jacksons or Al Sharptons—at least not any who show up on our televisions complaining about something every other night. So, it must be rather jarring for some people to discover that 21st-century Asians can feel as marginalized and disrespected as other minority groups in America. 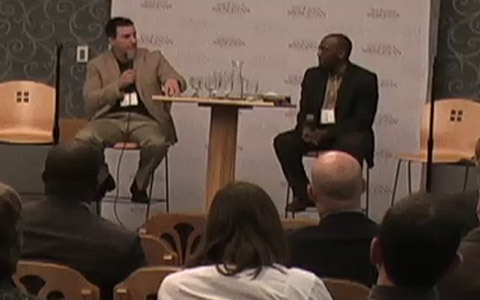 But, again, I don’t want to ascribe any ill intent to Mike Foster, Jud Wilhite, and their book. I believe they innocently waded into these choppy waters. As a published author, I know the excitement of coming up with a good idea, toiling over the computer to get the words just right, seeing your publisher get behind your vision, watching as the design team comes up with a great cover and the marketing team develops a winning campaign. Ah, and nothing compares to that day when your finished book finally arrives. Holding it, staring at it, flipping through its crisp pages is pretty much all you’re physically and mentally able to do those first few hours after receiving it. And when it’s a Christian book, featuring a message that you’ve prayed God would use to influence and transform lives, there’s just nothing that compares to this. Deadly Vipers is a beautiful little book. It’s designed and packaged with superb creativity, and the content is the kind of relevant stuff that Christian leaders and laypeople everywhere need to hear. I’m hoping the outcry against the book’s cultural blind spots will be tempered by grace and humility and empathy. I really resonate with this post at the Next Gener.Asian Church blog. Think about what Foster and Wilhite must be feeling right now. Over the last year or two, they’ve invested their lives into this little book. They hoped and prayed that it would help others, but now they’re feeling attacked by a passionate movement of folks whom they probably assumed would be on their side. I’m sure this has been an eye-opening experience for them. I’m sure there’s something for all of us to learn. I have heard indirectly, that Mike Foster will be engaging in a direct phone conversation with several Asian-Americans about ways to progress forward. This is very good news. As far as I know, this will be the first attempt by Mike Foster to engage in a direct dialogue with those who find the material problematic. Please be in prayer for this conversation and for ensuing conversations. Let’s pray for a positive outcome. Donald Miller discovered deeper meaning in life by applying the storytelling principles of a good movie to the way he lives. If your life were a movie, which one would it be and why? Readers have left some very interesting responses to that question already. So, if there’s a particular film or film character that encapsulates your life journey so far, please head over to UrbanFaith.com and leave a brief comment about it. UrbanFaith will randomly select five respondents to receive a free copy of A Million Miles, but the contest expires Oct. 19, so share your responses now. Sonia Sotomayor is an excellent Supreme Court nominee, but President Obama’s desire for “empathy” from the bench is off base. At least that’s what Yale law professor and bestselling author Stephen Carter believes. In the past, I’ve gone on record as agreeing with President Obama about his “empathy” test. Now I’m having to reconsider. What do you think? Check out UrbanFaith.com for my interview with Carter about Sotomayor, diversity in America, the Supreme Court confirmation process, and other topics.